Buy hand-forged copper pots and caldrons from Destillatio.eu online. 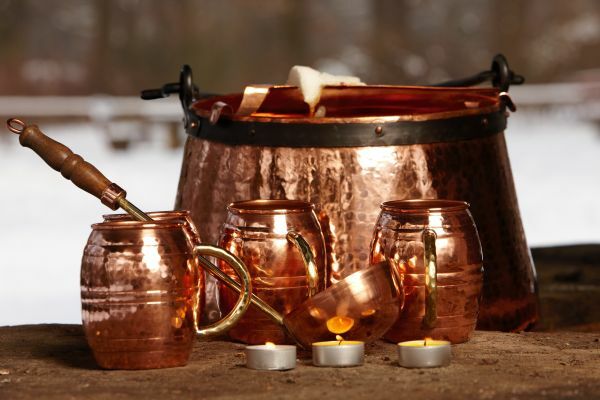 Copper cauldrons made of plain copper for brewing, preparing cheese dishes, boiling, simmering or simply just because our copper pots are so pretty. We have rustic, premium-quality, hand-forged copper utensils, which you can use any time for normal cooking, but also over an open fire. All copper cauldrons are individually hand-forged and the top end is reinforced with a firmly rivited wrought-iron band. Because of this, you can use the "CopperGarden®" copper cauldron filled to the brim and suspended. The bottom is somewhat flattened, so the pot can be also be placed and heated on a gas burner or, if necessary, on a hot plate which is large enough.